Residents of the largest homeless encampment in Aberdeen are facing an eventual sweep (https://komonews.com/news/local/aberdeen-shutting-down-homeless-camp-on-chehalis-river) with no clear indication of a new site to which they will be relocated. Mayor Larson recently released a statement indicating that all social service providers and advocates (including clergy) will now require a permit from the city before visiting the camp. The city also recently installed a gate to the property, restricting access for non-city vehicles. While this cuts down on traffic to the area, it has also made medical transport and access to services more difficult. Recently, residents took an ill man in a wheelbarrow approximately a quarter of a mile down the road to reach the Rev. Sarah Monroe’s car in order to transport him to the hospital. Though the mayor has repeatedly declined to call the upcoming clearance of the property a “sweep,” a public statement from his office indicates that vehicles (including vehicles serving as shelter) and dwellings will be cleared. Current residents (108 people) have been issued temporary permits to stay with no clear timeline for when people will be trespassed. Many others have simply moved downtown to sleep. While in a recent meeting, Larson urged people at the encampment to engage with social services, most residents reported that they had already done so multiple times and that there are simply not adequate services, particularly housing, to meet the growing need. 2018 alone saw the closure of the county’s youth shelter and Aberdeen’s emergency cold weather shelter. In this city of around 16,000, roughly a thousand people are homeless according to DSHS statistics and 500-700 are on the street any given night. 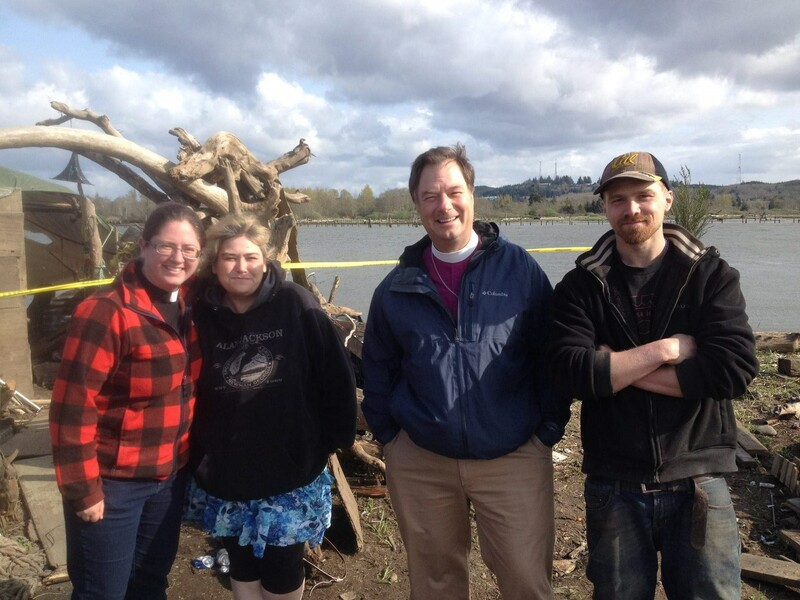 Chaplains on the Harbor continues to provide pastoral and organizing support to people living in the camp along the Chehalis River along with community meals, hospital and jail visits, as well as supportive employment and recovery programs for those getting back on their feet. You can make a donation to this ministry of solidarity and presence by mailing a check to P.O. Box 1248, Westport WA 98595; or by donating online below. This heartless action is not going unnoticed by the citizens of Pacifc County. I am urging people to call the Mayor who belong to Willapa Bay Resistance also urging people to tell the Mayor that we do not need to shop or spend our money in a town that treats their homeless in such an inhumane way. Our dollars are a vote to spend them in Aberdeen is to endorse this shameful policy, I told this to the Mayor. I stand in solidarity with the Homeless and all who are working to help them, We ALL Belong here.